All those picturesque photos you see of the Amalfi Coast? The real thing is at least 100x more unbelievable. Trust me. I spent four days of my Italy trip here and my eyes and brain were at odds the entire time! Every millimeter (go metric system!) of that coastal road had me questioning reality… practically pinching myself. Am I really here? Is this even real?? I couldn’t be sure. I’m still not sure! 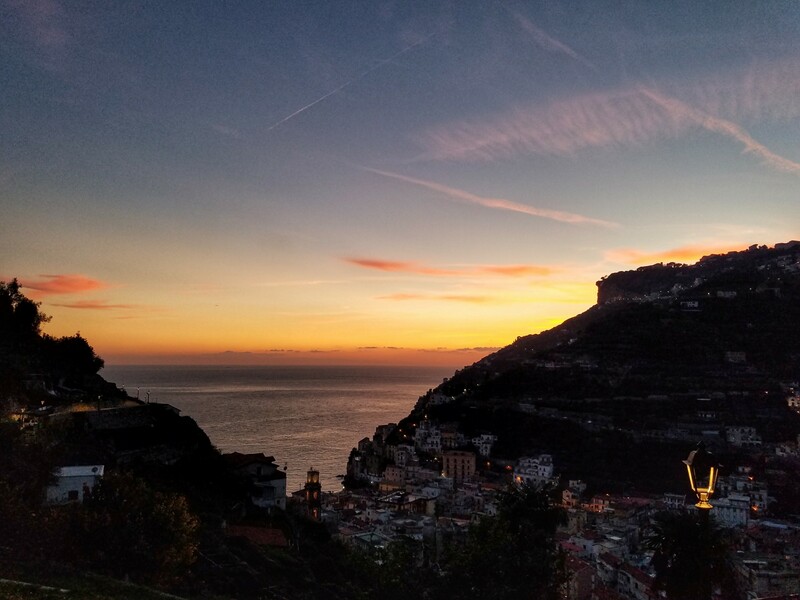 That is the bewitching magic of the Amalfi Coast. Love at first sight? Oh absolutely. For those four days, my heart lived in my eyes and nearly burst with every beat. Still now, my pulse quickens as I recall the dream-like memories of my time along the coast. But, for all its 40 kilometers of beauty, one particular spot along the Amalfi Coast stole the biggest chunk of my heart: the town of Minori. Far less touristy than the larger, well-known towns of Amalfi and Positano, Minori served as my home base during these days of my trip. Honestly, Minori wasn’t even on my radar until I started searching Airbnbs. The view from ‘Little house in lemon garden, hilltop, with parking’ won me over instantly, and its location happened to be in Minori! But why Minori, you ask? Simple. I’ll give you six good reasons and if these don’t convince you… eh, you’re a lost cause. Ha! But really, I know we all have our preferences, so no judgment. I promise. Still… hear me out! Naturally, I could speak only to the food and the views, but those are a given, right?? 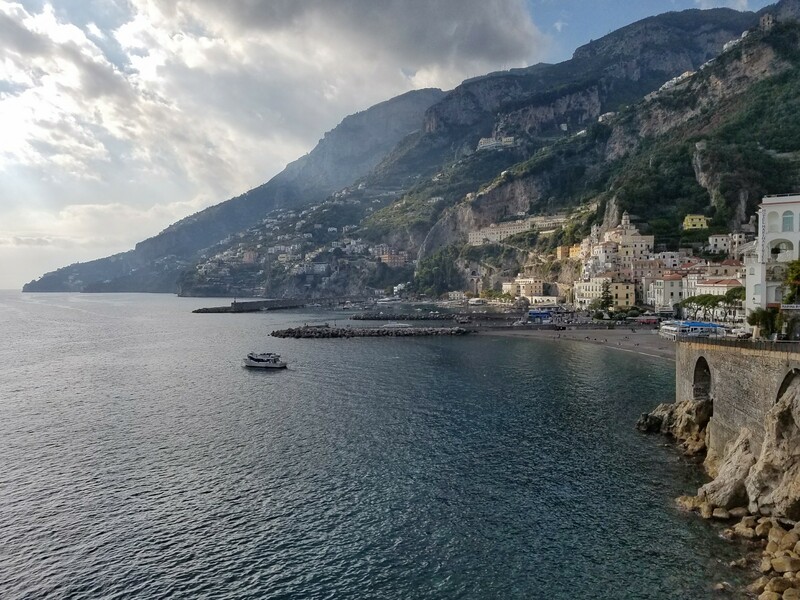 I mean, we are talking about the Amalfi Coast… in Italy… where you won’t find a bad place to eat or direction to look anywhere you go! And Minori is not exempt from these fine perks. But this dear town is so much more than local cuisine and stunning sights. THAT AIRBNB. What a find! The view that greeted me each morning was basically a postcard come to life. And I savored it. Boy did I ever. It would have been a waste to gaze at that view and not be fully present to embrace the beauty. Even the 400 (yes, 400) steps from town up to the little house were worth it. In fact, when walking up those steps, I stopped at various points, not just to appease my screaming muscles, but also to gaze back on the town below. The higher the better! And it wasn’t just the panoramic coastal view that sold me on this particular Airbnb. Another perk is having access to the adjacent lemon garden. Walking among the trees along the terraced hillside is rural Italy at its finest! Oh, and Ferdinando is THE BEST Airbnb host. So yeah, book this place ASAP. Click HERE. CENTRAL LOCATION. If you pull up a map of the Amalfi Coast (go ahead… pull it up… I’ll wait…) you’ll see that Minori is pretty darn near centrally located. That makes it the ideal base if you want to explore the entire coast. And, believe me, you want. NOT TOURISTY. As I mentioned above, Minori is not a touristy town. Sure, it has visitors just like all the other coastal municipalities, aaaannnnd, I realize I did visit just after peak tourist season. BUT. The main streets are free of those kitschy souvenir stores, and there isn’t a single gelato-only shop in town – which, to me, are major signs that Minori is as authentic as they come. WELCOMING. The people of Minori are wonderful! 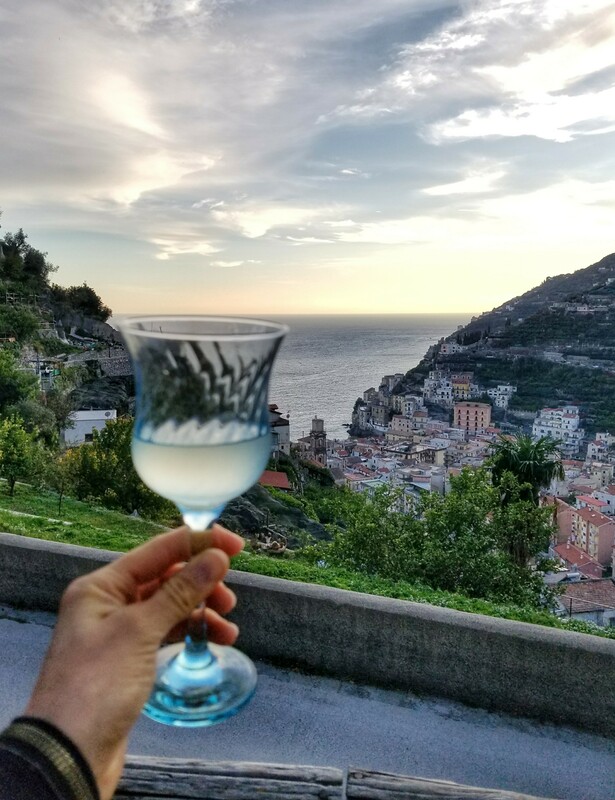 My Airbnb host, Ferdinando, gave me a hearty welcome complete with a bottle of his family’s very own limoncello – which we promptly sampled as a toast to my arrival! On my second night, Ferdinando also gave me tour of the town’s hidden gems, complete with a highly entertaining AND educational history lesson. But he wasn’t the only one to show me kindness. Shop and restaurant employees were quick to adapt to my “no Italiano.” Even if their English was limited, we managed, and none seemed the least annoyed. Rather, many were interested to learn where I traveled from and how long I planned to stay. WALKABLE. 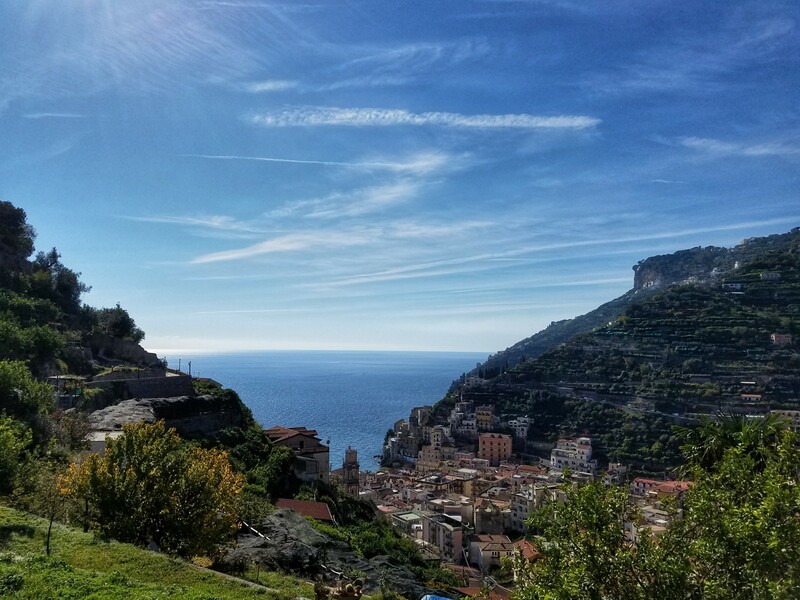 Though I rented a car (in Naples), I only used it once during my stay in Minori – and that was to drive 2 ½ hours east to Pietrapertosa, for my Volo dell’Angelo zipline experience. (More on that in a future post!) 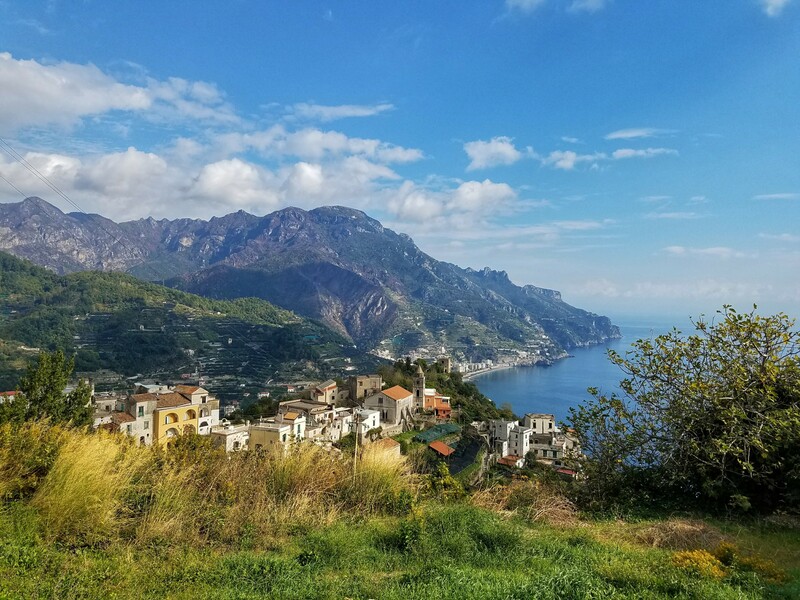 Everything from Minori all the way to Amalfi is accessible by foot – that is, of course, if you like walking and hiking as much as I do! 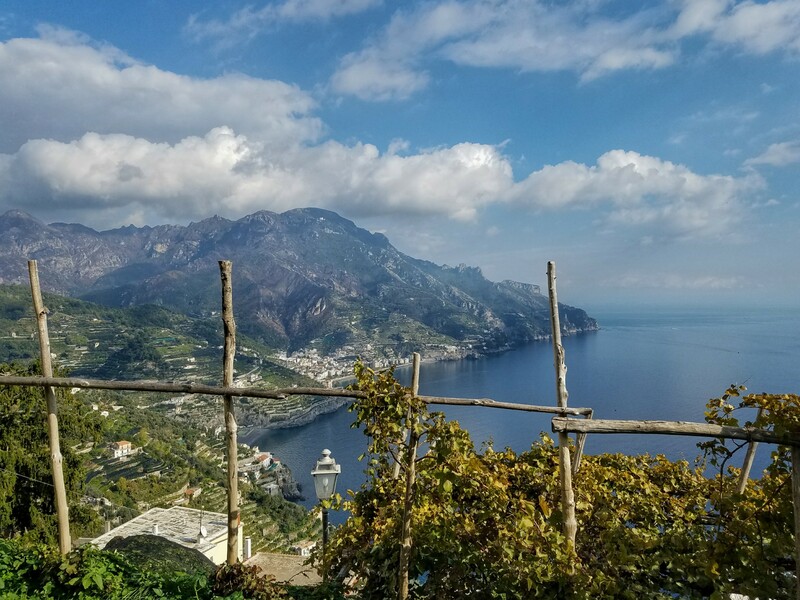 Ferdinando sold me on his recommendation to hike from Minori up to neighboring Ravello. Up, indeed! Starting at the base of town, I climbed approximately 1,500 steps (no joke!) and still more inclines that aren’t technically steps (but tell that to my glutes). All the muscle ache quickly dissipated once I reached the top, though. Views. Views. VIEWS. And, from there, I realized I was already halfway to Amalfi and decided to continue onward. Why walk all the way back to Minori, drive to Amalfi, then spend loads of Euros on a parking spot (if I were lucky enough to find one)?? Nope. My legs were perfectly capable of getting me there for free! Oh, and on day three I walked the other way to Maori and beyond. 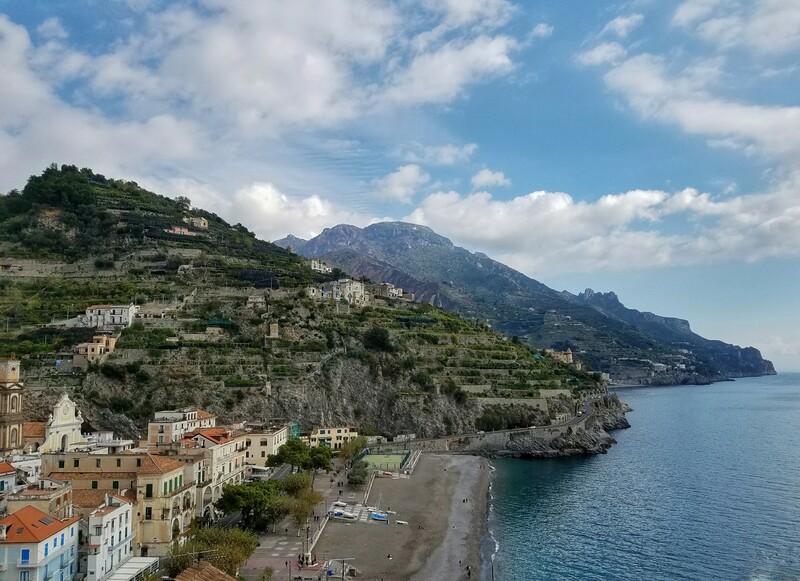 So, I basically covered at least 4 miles of the Amalfi Coast on foot, which is MUCH preferred over trying to (safely) snap photos while driving – which I, errrrrrr, ummmmmm, may or may not… or may… have done. HISTORY AND CULTURE. Despite being merely kilometers away from its neighboring towns, Minori is distinctive. 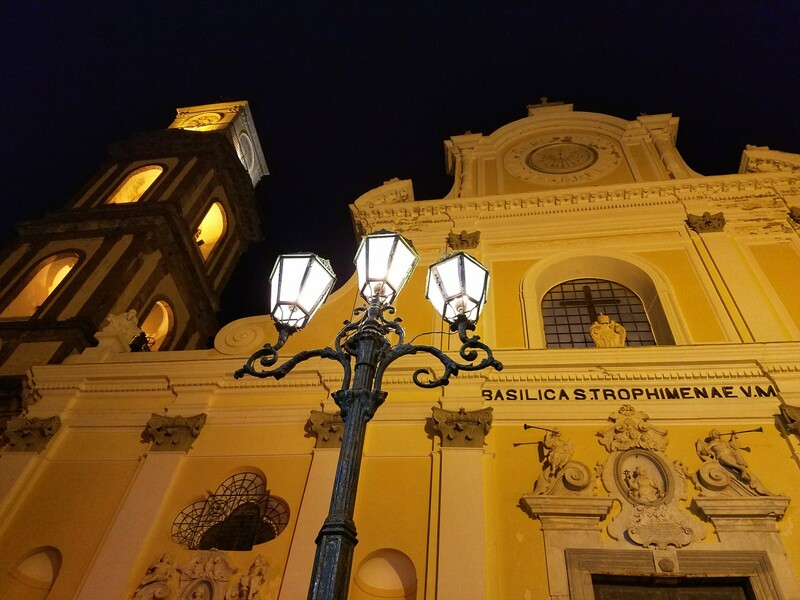 For one, the town has its own saint, Trofimena, who is celebrated three times annually – thanks to two separate (and, dare I say, humorous?) incidents with her saintly remains. Another Minori-specific event is its depiction of the passion of the Christ on Good Friday. Townspeople don white hooded tunics for the procession, and the entire town is illuminated by candles. 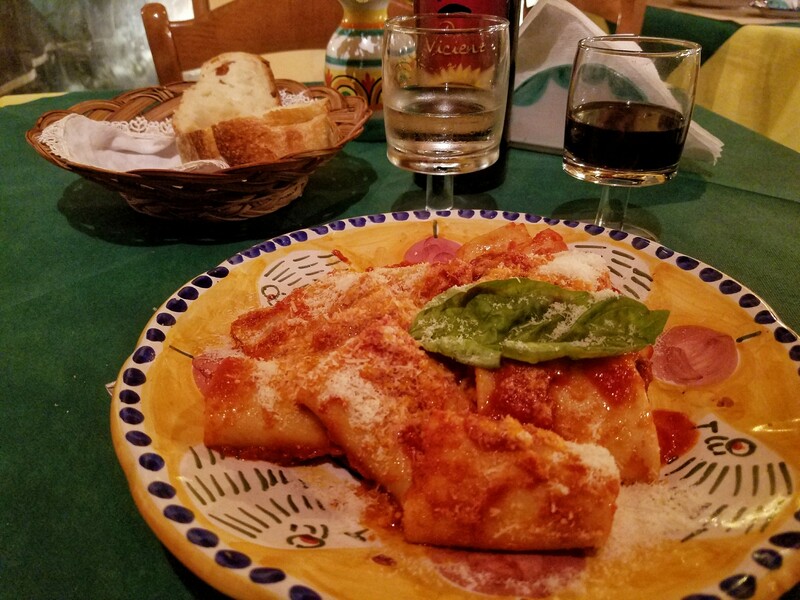 And thirdly, while the entire Amalfi Coast is renowned for lemons and paper, Minori is also historically famous for its handmade pasta. And, after all that walking, you need quality carbs. I’m tellin’ ya! Now please tell ME I’ve convinced you to visit this magical town. Oh, you MUST! Stay here. Shop here. Eat here. Pretend like you live here as you explore the maze of narrow, cobblestone streets, and travel up and down those hundreds of steps. Listen to the clock tower chime every half hour. Wake up to roosters and hazy Mediterranean views from hillside heights. And engage with the fine folks who call Minori home. You might just want to call it home yourself!